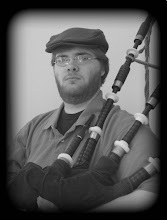 October 24th was the 2nd annual Ceol Na Pioba Solo Bagpipe Competition. Even though the planning kept me busy, I got to compete and enjoy the camaraderie. Lezlie Webster judged this year, which was her first time in Louisiana! Fortunately the weather held off a week before getting nasty! It was really great meeting Lezlie and having the opportunity to play for her. I began with the 2/4 March, which I was very pleased with. Then the strathspey/reel, which I think has been my best playing of to date. My 6/8 crashed in the 2nd part, but the 1st, 3rd, and 4th parts really sang. I am still beating myself up about that. The Jig was nice too. More videos are up at www.youtube.com/user/CeolNaPioba. Dunbar Poly P-2 drones, Kron ABW chanter, drone reeds are Apps/Naill, bag is the older Ross ex-small zipper without the guts, moose valve.